This is the next in a series of the original 6 Paw Patrol dogs. This is Zuma. He is the designed to portray an aquatic rescue professional. Zuma is a chocolate Labrador. He, along with the other 5 Paw Patrol dogs, are a request from a co-worker. The others will be coming soon. Worsted weight yarn: Café latte, white, orange, black, blue, and olive green. Rds 6-9: sc in each sc around. (36) Change to orange after Rd 8. Rd 30: (sc in next 3 sc, sc2tog) 4 times, sc in next 4 sc. (20) Change to café latte. Embroider EYES and EYEBROWS on PAW PATROL ZUMA. Rd 4: sc in each sc around. (12) Change to gray. Rd 5: sc in each sc around. (12) Change to orange. Finish off leaving a long tail. Sew PUP PACK AIR TANKS to PUP PACK. Rd 1: With white, ch 11, sc in second ch from hook, sc in next 8 sc, (ch 2, 2 dc, ch 2, sc, ch 2, 2 dc, ch 2) in next ch working around ch, working in free loops of foundation ch, sc in next 8 ch, (ch 2, 2 dc, ch 2, sc, ch 2, 2 dc, ch 2) in next ch, slip st in first sc. Finish off leaving a long tail. Sew PROPELLER BASE to BONE PROPELLER. Sew PROPELLER assembly to PUP PACK. 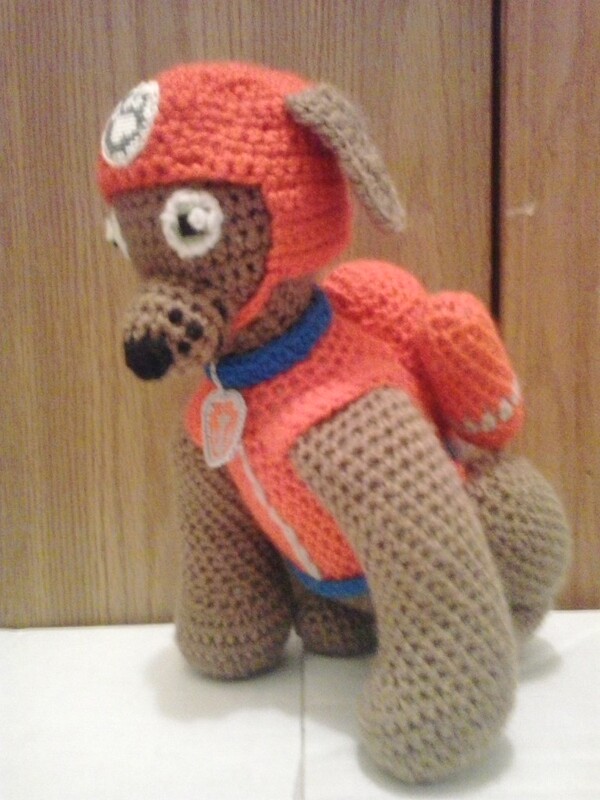 Sew PUP PACK to PAW PATROL ZUMA. Rd 11: Ch 1, turn; sc in next 17 sc, ch 2, skip next 2 sc, sc in next 6 sc, ch 2, skip next 2 sc, sc in next 17 sc, slip st in first sc. Rws 13-17: Ch 1, turn; sc in each sc across, ch 15. Finish off leaving a long tail. Place HAT on PAW PATROL ZUMA and sew chin strap to other side of HELMET. Finish off leaving a long tail. Sew EARS to head of PAW PATROL ZUMA. Zuma and Paw Patrol are copyright Spin Master Entertainment and their respective creators.